It is the general consensus amongst the voters of Sri Lanka, that we certainly need a change away from petty politics and to focus on developing the country in all fronts, may it be education, Trade, health, Transport, Agriculture and General administration while enforcing the rule of law. The incidents that have been happening around country will not be condoned by any person with slightest brains. We have been observing a rapid escalation of violence specially aimed at the opposition candidate and his supporters by the Government led cronies and the General administration. Police have been always taking the side of what ever the government in power due to political pressure brought upon them. This is why the 17th amendment was introduced to install a Police Commission which Mahinda Rajapaksa repealed while introducing the 18th amendment. Today we see that in spite of enactments and assurances by the parliament giving powers to the Commissioner of Elections, the commissioner has become a powerless individual who had utterly failed in implementing the rule of law due to interferences by the Government, led by short sighted politicians. The prevailing situation is detrimental to the mere existence of this beautiful country and it’s so called “democracy” when the Executive has failed. Once again this is why the 17th amendment was introduced to install an Elections Commission which Mahinda Rajapaksa repealed while introducing the 18th amendment. A pathetic situation has been created where the administration has been totally taken over by the President and his office. Implementation of the law is carried out by the responsible agencies only on instructions received from the Presidents office. A Police department’s basic function is to maintain law and order. Directions to officers should come from IGP and not the Presidents office. Today we see that Presidents office has taken over this function and delegated it to the Members of Parliament to administer the law in their respective electorates and districts. Such political violence is being committed by the provincial level politicians such as Pradesheeya Sabaha and Palath Sabaha members of the government. No one will approve this since when the tide turns similar violence will be committed by the next winning party. Where will this end? We need a change. We observe that the Presidents main opponent Maithripala Sirisena is being intimidated continuously by assaulting his supporters, setting fire to his electoral party offices while shooting and pelting and stones. Also injuring innocent people who attend MS’s rallies. Government ministers, the Sri Lankan Army, CID and the Police have been giving contradictory Press briefings as regards to the list violations sighted by the independent election observers such as PAFFREL and CAFFE. All these are happening under the draconian powers of the President. This happens due to enormous powers vested in the Executive Presidency. We all know that the President is not answerable to any one. He is almighty. At times even greater than the GOD. This situation has led to the general deterioration of peaceful existence of the people. Being not answerable to any one has resulted in an anarchical situation. No person in the country can charge President for any wrong doings. He or she goes Scot free. Enormous powers being vested, President has the capacity and opportunity to move the officers in all fields of administration to work for his and his political party’s benefit. This is being observed today. If it is to the benefit of the country and it’s people no one would grumble. Media and Police are two important agencies where the President could influence to his benefit but not the country at large. We observe every day, with disappointment the gross violation in the use of state Media and inactive Police in the run up to the presidential elections. A simple example of Presidents enormous power is displayed, when the Executive decided to ignore the decisions of the High court. As peace loving citizens of Sri Lanka we were amazed & surprised to observe President being inactive and reluctant to follow the rulings of the Highest Court of Sri Lanka. The Supreme Court decision on the Petroleum hedging deal where billions of poor man’s money was plundered due to mismanagement and the directions given to conduct activities of the Electronic and printed media in a balanced manner during the run up to the Presidential elections was grossly ignored. We wonder whether any one is initiating action for contempt of court against the people responsible for the violation of High Court orders. This situation is detrimental to the mere existence of Law and order, and leads to the deterioration of democracy, which would eventually result in the birth of a cow boy type gun culture in Sri Lanka. Sri Lanka is gradually stepping towards the first ever banana republic. The 17th amendment directs the President to appoint an independent election Commission, Police Commission and Judicial service Commission and Public service commission. 17th amendment was over ridden by the 18th amendment to the constitution with the extension of the number of terms that a person could contest the Presidency to unlimited times. The neglect by the president to appoint the said commissions cannot be questioned since the President is not answerable to any one. Why is the President reluctant to appoint the said commissions? What we understand is that with the appointment of the said commissions the President’s powers will be reduced and the commissions would be in turn answerable to the parliament. The said four commissions would be so powerful, even the President will not be able to interfere with the functions of the Judiciary, Police, Elections department and the Public service. The Parliament appointed COPE report that was presented by Wijedasa Rajapakshe to the Parliament, where several irregularities were highlighted for the President and the Government to take action was not considered. No action was initiated. However we observed one individual Vasudeva Nanayakkara going to High Courts and obtaining redress for the people of this country. This was the sale of Insurance Corporation, which was found to be irregular. Political culprits behind the deal were never apprehended. Parliament has become a mockery in the hands of the Presidential system. It has no powers to initiate action on political culprits who have conducted shady deals, even after they have been found guilty. The responsibility of punishing such politicians has fallen in to the hands of the Public. If not for People like Mr Vasudeva Nanayakkara rising to the occasion and initiating legal action a few shady deals would have gone under the carpet. However it is a pity that the Political Culprits have gone Scot free leaving the officials who conducted such deals on the direction of political culprits to be punished. This is one good lesson for the officers who carry out incorrect orders. Without doubt there will be some individuals or organisations initiating legal action to obtain redress on behalf of the public. So the officers be aware. Do not carry out illegal orders of the petty politicians. Politicians will betray at every possible turn. They will be gone in no time leaving the officials to shoulder responsibility. We have observed with statistics that the Political thuggery has escalated with the implementation of the Presidential System of governance. Non action by the police on the direction of President appointed cronies have resulted in this escalation. 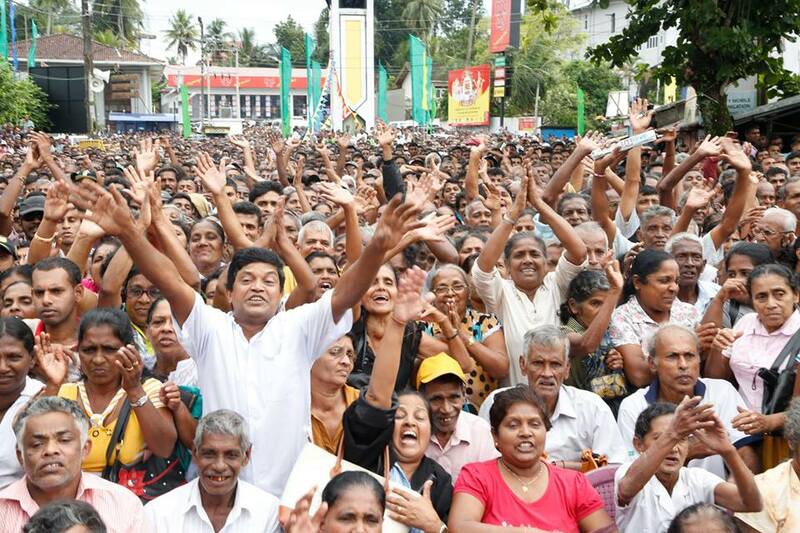 For the first time in Sri Lanka we observed the mobilisation of the Army towards a political divide. The Executive uses the Army high ranking officers to help in achieving a political objective. This again is a step taken by the executive towards dividing the Armed forces thus creating a dangerous situation in terms of national security of our country. The powers extended to such divisions should be immediately stopped since the same powers sometimes could be misused against the executive. So we need a change. We need to install an Executive who is answerable for any wrong doings. Who is accountable to the public? As far the executive Presidency is concerned a change should happen before it is too late. JR Jayewardene’s constitution was never accepted by the then opposition. As a result of this protest in 1994 Mrs CB Kumaratunga canvassed to abolish the Presidency when she became the President. She ruled for 11 years and attempted to abolish the Presidential systems but could not muster sufficient support from the rest of the members in the Parliament. Mahinda Rajapaksa went on the same line and promised to abolish but ruled for 10 years and seek re-election under the same set up to become the President once again. He had the required two third support in the Parliament but never ventured into doing so. He has totally ignored abolishing the system. Adding insult to the injury he has extended the term not only for the third time but unlimited times. When he promised to abolish, all what he could have done was to gain the support of opposition and abolish as promised, and then go for an election where he could have become the executive Prime Minister. People gave him the opportunity to abolish the presidency twice and have no faith that he will ever do it. Now the responsibility has fallen on Maithripala Sirisena’s lap. If he fails to abolish powers he will be leaving a much cracked and failed Sri Lanka since we are certain that running the country from a solitary office will never bring good governance, justice or any desired results. The powers vested in the, have reduced the powers of the cabinet of Ministers. President runs the country in consultation with a hand picked group of people whom he trusts. Unlike the President, this group of people are never seen by the public, but the President who is not answerable to any one for the incorrect action and wrong doings of those hidden faces. People need to consider the best possible process, to immediately abolish the Presidency. People have lost faith. As it is, the only avenue was to elect a person who is not affiliated to any political party. The only task would be to abolish the Presidency as promised. This will create a situation, where if such a person elected delays or postpones the abolishing of the Presidency, to be ousted, through a motion of no confidence or impeachment by all parties getting together, since the President elect will not belong to any party. Although MS is from a political party (SELF) he has no clear identity. However he has the backing of other political parties to ensure that he performs as desired to abolish the Presidential system. Time has now passed for the incumbent President to act. He could have abolished the Presidency or reduced powers in such a manner making the Seat of the President answerable to the Parliament and the people. He would have been remembered and honoured for a long time to come. Time is ripe for all non political organisations to commence a dialog and initiate discussions towards abolishing of the Presidential powers for the best of Sri Lanka. The introduction of the 18th amendment has paved way for a dynastic rule in Sri Lanka. The seat of the Presidency will be successfully handed over to family members when the time is appropriate. Lord Soulbury introduced a Parliament system, responsible to the people. British and the European nations have done away with Dynastic rule and reverted to parliament system of democracies, where the executive is answerable to the parliament and the people. With the 18th amendment we have reverted back to the Dynastic rule of Governance. Is this what majority people want? If this is to come by, we wish to leave Sri Lanka in the hands of GODS. This has sent shock waves down the back bones of many. We need a change to repeal the 18th amendment and re-activate the 17th amendment to introduce good Governance back in good old Sri Lanka. Indeed , a change We need .Lets breathe some fresh air on the 9th. Democratic Socialist Republic of Sri Lanka.. This is not a new development. It has been going on for a long time. I remember a time when Public Servants who had worked for the Good of the Country, during one Regime, is sacked overnight, and Sycophants without any Qualifications or Experience, installed in their place. The excuse was that they were Supporters of the previous Regime. Supporting a Regime is not a Qualification that should be required of Professionals. It is no wonder that Professionals with Experience and Qualifications opt to leave the Country, in droves! WE NEED CHANGE! Yes, we all agree. But the Gods have played a dirty trick on us. The Gods are asking us to chose between two old time crooks, who until weeks ago, would eat hoppers together, and sing each other’s praises, going up and down this blessed land making vacuous noises, all the time screwing WE the people, left, right and centre. So, is this the best we’ve got? In a land of smart and courageous people, erudite scholars, successful businessmen and more, we end up having to put our nation in the hands of proven sharp operators who have no ethics, no honour and no integrity. I wouldn’t even buy an used car from these two. Where are our bright men and women? Do none have the qualities of integrity and honour and the capacity to appeal to the suffering people who deserve better. Who will lead us to the promised land? Sad to say, come Thursday, whoever wins, there will be no change. I always live in hope, so I reserve the right to cheer if I am, against all odds, proven wrong. What is your problem old man? We have enough talent in the UNP, with people like Upul Jayasuriya who is fit to go on the national list and become justice minister tomorrow. He has done yeoman service to the Bar Association by developing a close relationship with USAID and Michelle Sison. Upul also was an intern under Lalith Athulathmudali, and despite not having much of a school or law college academic record, an ok sort of a guy. We must vote for MS just for the sake of Upul. Come on, use your brains people. Wambatta; since you ask, my problem starts with the UNP, the largest organised political party in this country. They had 5 years to prepare for Thursday. Instead they spent their energies in internecine jostling. Ranil was fully aware that this day would come. He should have been super-confident after giving MR the rout in Uva. So, when Ranil got the first whiff of the King’s plan to call an election (we were holding our collective breath waiting for the announcement) he should have come out and declared his challenge. Instead Ranil prevaricated, and he was manipulated by a puppet-mistress into supporting MR’s spittoon-carrier, and the organisers of the largest, and oldest party in the show has been dragged into supporting a turncoat who fancies his chances. So, just to recap; Ranil who lost to MR by less than 182,000 votes in the 2005, has stepped aside for the second time to allow some come-lately-opportunist a chance, and the party has to pull together to support this ‘common candidate’ who only a few weeks ago was calling the UNP party stalwarts all kind of derogatory names. Is there NO shame in this party? DO NOT THINK that Maithripala, till lately Mahinda’s henchman, is going to do the UNP any favours if and when the time comes. He has already a queue of his own ‘crossover’ supporters holding out their begging bowls to be filled first. Ranil constantly talks about democracy but doesn’t allow internal party democracy ! No leader in any party in any world has held on to the party leadership after 20 years of electoral defeats ! I will join you Spring in cheering if against all odds things change but I am very very pessimistic. When the opposition is full of people who have a track record of subverting justice. Starting from the very top, Maithri who prevented the law from taking action against his son when he attacked Asela Waidyalankara. Rishad Bathiudeen who attacked a sitting judge and stoned a court premises in Mannar and who has violated wildlife regulations in clearing the Wilpathu national park. Champika who is on record having defended the likes of BBS and who has spoken out against minorities. Hakeem and Faizal Mustafa who switch sides for personal profit than for the people. Chandrika who was convicted of abuse of power by the supreme court and who turned a blind eye to the atrocities in Wayamba. Well said. My vote is simply an anti rajapakse vote and not a pro ms one.If we can get this scoundrel out, we will have our work cut out for us to ensure meaningful change. We need a change. We need to change our present consituition, we need good governance, we need decency in our society, we need a corruption free society, we need to reduce the cost living, we need to see fairplay and justice to all our citizens, we need to see all commissions relating to the indepemdence of the judiciary, police, public service and elections commission. We need peace in our daily lives. Looking forward to these changes and eventually forget the recent past few years as bad dream.